Two-factor authentication (2FA), a type of multi-factor authentication (MFA), is a security process that cross-verifies users with two different forms of identification, most commonly knowledge of an email address and proof of ownership of a mobile phone. Used on top of the regular username/password verification, 2FA bolsters security by making it more difficult for intruders to gain unauthorized access, even if a perpetrator gets past the first authentication step (e.g., brute forces a username and password). Today, 2FA is commonly employed in online banking websites, social media platforms and e-commerce sites as a way to harden access controls to the more sensitive areas of a web application (e.g., admin panels or areas that store credit details and/or personal data). Two-factor authentication also enables businesses and public institutions to be more productive and efficient, allowing employees to perform remote tasks with far less security concerns. Knowledge factors (something the user knows) – Common examples are email addresses, username-password combinations, answers to security questions, and the CVV on the back of a credit card. Possession factors (something the user owns) – Examples of this authentication type include a mobile phone, USB token and a card reader. Inherence factors (something the user is/has) – This authentication type pertains to unique physical attributes that are inherent to a single person, such as fingerprint readers, retinal scans and voice recognition. 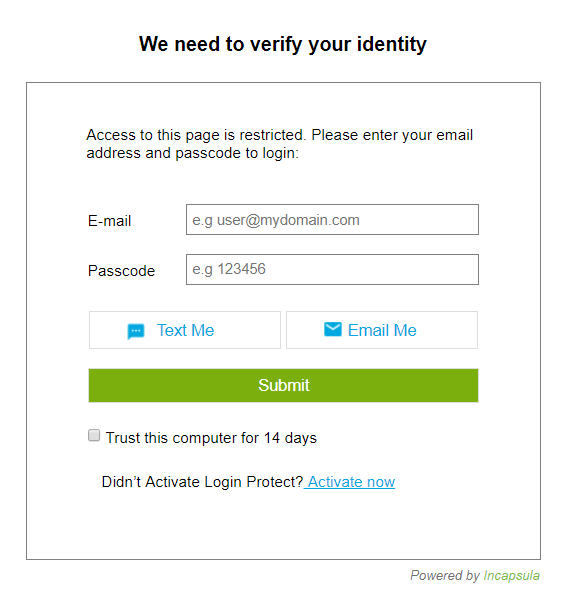 2FA example using a mobile device. Typically, the 2FA method verifies the user’s identity against a knowledge factor alongside one of the remaining two factor types. Going to the ATM is a good example, as the bank requires that you provide both your credit card (possession factor) and your personal identification number (knowledge factor) to take out money. Increased login time – Users must go through an extra step to login into an application, adding time to the login process. Integration – 2FA usually depends on services or hardware provided by third parties, e.g., a mobile service provider issuing verification codes via text message. This creates a dependency issue, as the enterprise has no means of controlling these external services should a malfunction occur. Maintenance – Ongoing maintenance of a 2FA system might prove to be a chore in the absence of an efficient way of managing a database of users and various authentication methods. Two-factor authentication can play an important role in securing your website by blocking a number of application-based attacks. These include brute force and dictionary attacks, in which perpetrators use automated software to generate massive amounts of username/password combinations in an attempt to guess a user’s credentials. With 2FA enabled, these attacks are fruitless—even if perpetrators are able to discover a user’s password, they still lack the second form of identification needed to login to the application. Additionally, two-factor authentication can help applications counter social engineering attacks, e.g., phishing and spear phishing, which attempt to dupe a user into revealing sensitive data, including their username and password. Even in the event of a successful attack, a perpetrator would still need the additional form of identification required by a 2FA solution. As such, the Payment Card Industry (PCI) Data Security Standards (DSS), which is used to secure credit and debit card transactions against data theft and fraud, requires 2FA as a fundamental prerequisite for receiving certification. Imperva Login Protect allows you to deploy two-factor authentication on any URL(s) with just a few clicks of the mouse. The service offers an end-to-end solution, allowing you to manage your user database and verification process with ease. Imperva cloud 2FA login screen. Activating our 2FA service doesn’t require integration or code edits and is automatically compliant with any type of website or web application that uses Imperva cloud services.